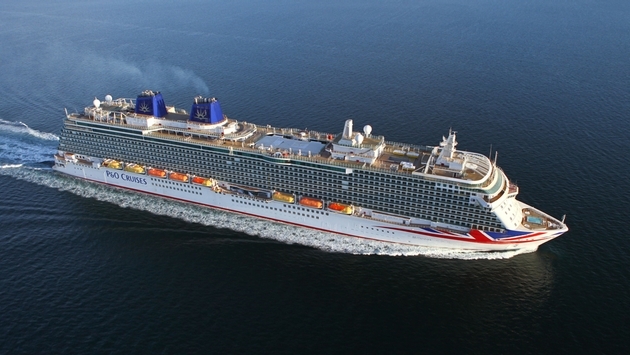 Fincantieri shipyard in Italy has delivered the Britannia, the new flagship of Carnival Corp.’s British line, P&O Cruises. At 144,000 gross tons, Britannia is the largest passenger ship ever built by the Italian shipbuilder for P&O, which was founded in 1837. 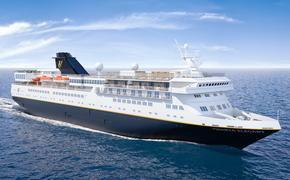 It has 1,837 cabins, of which 75 percent have a balcony, and it can accommodate 4,324 passengers double occupancy. A ceremony was attended by Enrico Morando, the Italian deputy minister of economy and finance; Micky Arison, chairman of Carnival Corp.; David Dingle, executive chairman of Carnival UK; and David Noyes, CEO of P&O Cruises; Fincantieri was represented by Giuseppe Bono and Vincenzo Petrone, respectively CEO and chairman. Britannia will be the first P&O cruise ship with a new livery featuring blue funnels and a stylized Union Jack draped over the bow. It will also be the first cruise ship built in Monfalcone with two funnels. The last liner delivered by Monfalcone with this feature was the Eugenio C in 1966. Special features include The Cookery Club, a 24-person cooking school; a three-tier atrium with a patisserie, a charcuterie and gelateria; and The Limelight Club, a combined entertainment and dining venue in the tradition of the supper club. Fincantieri has built 68 cruise ships since 1990 and has now 16 ships under construction or in the design phase.